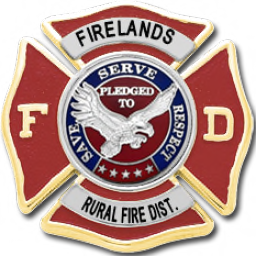 The Firelands Rural Fire District: Thank you! At the request of several former members the district will remain but in a reduced capacity. Thank you to Cale Solo for offering to step in and try to revive interest in the district. I wish you the best of luck in trying to drum up new membership. I'd like to say thank you to everyone for trying and sticking it out. Unfortunately, good intentions just aren't enough. The district has fallen apart. Those of us left just don't seem to be enough to hold it together anymore. So, before friendships are lost we will say goodnight. Firelands Rural Fire District has closed the bay doors for the final time. The apparatus cleaned and put to rest. Bunkers hung up and uniforms tucked away in the closet. And the Chief hangs up her helmet. These pages will be left up until the www.firelands-rfd.org domain name expires later this year. At that point it will be archived.